- i know you guys have it so the tank and turret are only accurate whenever an admin uses it because whenever i use it i miss 80% of my shots in phoenix 3 yet 002 chance and all of the other admins kill me in 2 seconds. i rarely miss in bloodgulch and other maps so wtf? this is unbalanced and you need to either make it so all players have it or no players. Could you guide me to some of your work please? You win the award for funniest post I've seen this week. I don't even think I played Phoenix 3 and this is still hilarious. -It's a mod. So obviously things are changed. -Reducing pistol damage balances the map, in case you didn't notice, other weapons exist. Also who's Bugie? I'd love to meet him. -You do realize how absolutely lunatic you sound with this right? Perhaps stop hating the game, and start hating the player. -Look for the damn rock then. -The rocket launcher is not impossible to get. It's factually fairly easy to reach. -How... HOW, HOW IN ANY WAY WILL GOLD ARMOR HELP YOU WIN. You sir, are an insignificant ball of redundancy. How much is the gold armor? i know you guys have it so the tank and turret are only accurate whenever an admin uses it because whenever i use it i miss 80% of my shots in phoenix 3 yet 002 chance and all of the other admins kill me in 2 seconds. i rarely miss in bloodgulch and other maps so wtf? this is unbalanced and you need to either make it so all players have it or no players. The Incendiary Shotgun has almost half the range of the default shotgun and even deals less damage, which is partially offset by a narrower spread. As a result, it's actually far less effective in use than the default shotgun, but it's a lot more fun, which is why it's so heavily used. The pistol does the exact same damage as default, but lacks a scope and has slight kick to make it more skillful for balance purposes. 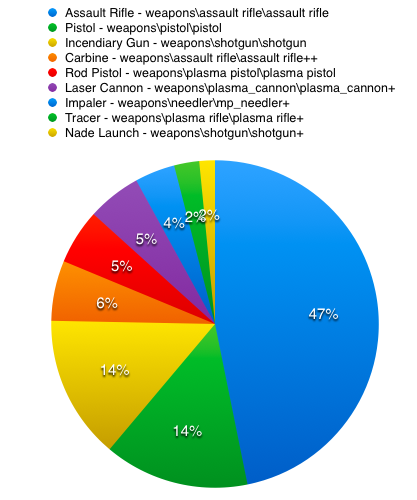 The original pistol is very overpowered in its sandbox, and while it's more sensibly balanced in this one, it still has the most kills attributed to it and is the second most utilized weapon. You're mistaken, and only 002 and I are admins on the server. There is no sniper rifle; 002 is messing with you likely because of these ridiculous claims. The rocket launcher is not intended to be obtained, and is only there for game variant compatibility. Gold armor is just a color variation, and 002 is the only one with it because it's his server. It's not a Halo Carbine, so that's probably why you don't remember.